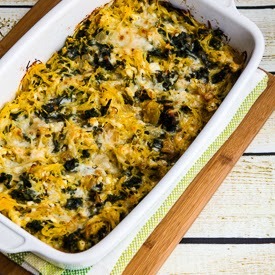 Twice-Baked Spaghetti Squash with Kale, Feta, and Mozzarella is delicious for a low-carb side dish or a Meatless main dish. Use the Diet-Type Index to find more recipes like this one. 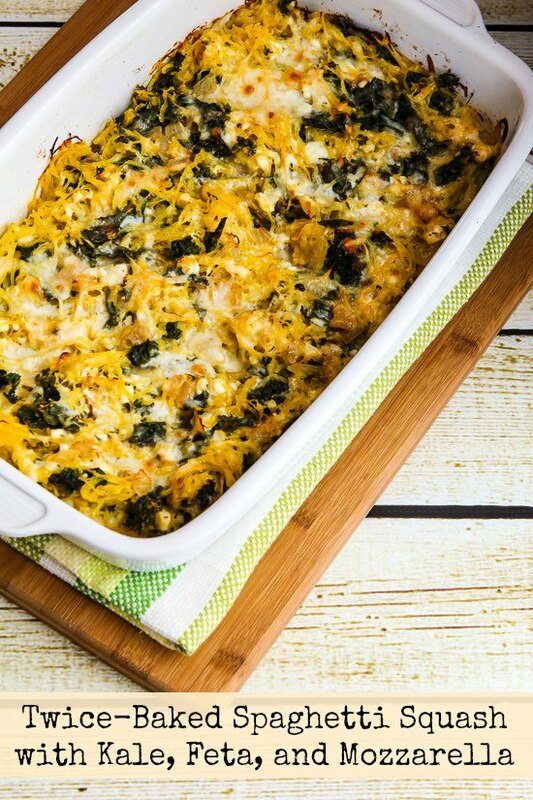 Click here to PIN Twice-Baked Spaghetti Squash with Kale, Feta, and Mozzarella. I don’t have any kind of clever creative story about how I came up with this Twice-Baked Spaghetti Squash with Kale, Feta, and Mozzarella except for the fact that my local store had organic kale on sale for $.99 a bunch (!) and I went a little crazy buying kale. So then I had to start thinking of ways to use it, and I had a big spaghetti squash on the counter staring me in the face. Most definitely this is a riff on the Twice-Baked Spaghetti Squash with Pesto and Parmesan that’s been so popular on the blog, but the generous amount of kale makes this feel like a more substantial dish, to me at least. I’d love this for a low-carb side dish but it would also be great for a meatless main dish. I’m trying to get back on track with Meatless Monday on the weekend so people can make the recipe on Monday, so I’m proud when I manage to do that! But when I don’t manage that you can find lots of Meatless Monday Recipes in the archives. (There are plenty of Vegetarian Recipes and Vegan Recipes in the photo index as well.) I also have a very active Meatless Monday Pinterest board with ideas from blogging friends. 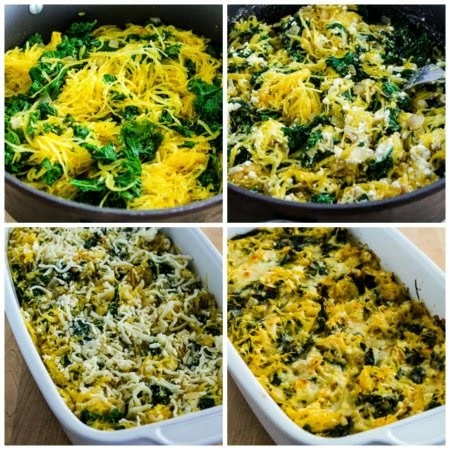 Edit: Twice-Baked Spaghetti Squash with Kale, Feta, and Mozzarella was featured in the Top Ten New Recipes of 2015 (plus Honorable Mentions). While the squash cooks, saute the onions until they’re getting brown and place onions in a bowl. Heat a little more oil, add chopped kale, and saute until it’s barely wilted (or longer if you prefer.) Mix together the crumbled Feta, grated mozzarella, cottage cheese and thyme. When the squash is done, scrape out the “spaghetti” part and discard the skins. In the large pan where you sauteed the kale, gently stir together the spaghetti squash, kale, and onions. Then mix in the cottage cheese/cheese mixture until it’s well combined. Put the mixture in a baking dish, sprinkle with the other 1/2 cup Mozzarella, and bake at 400F/200C about 30 minutes, or until it’s bubbling and nicely browned on top. Serve hot. Twice-Baked Spaghetti Squash with Kale, Feta, and Mozzarella is delicious for a low-carb side dish or a Meatless main dish. Preheat oven to 400F/200C. Cut spaghetti squash in half, scrape out seeds and stringy parts, and place squash on a baking sheet. 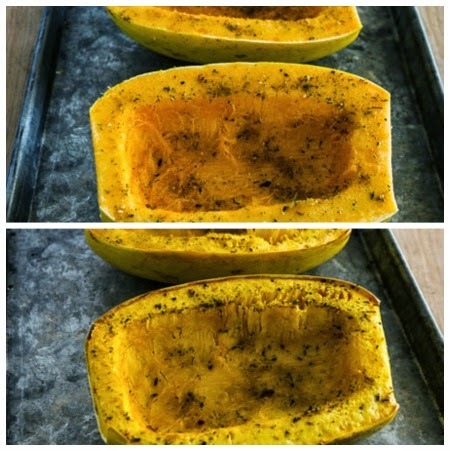 Brush each squash half with about 1 tsp. olive oil, sprinkle with 1 teaspoon Spike Seasoning, and season with salt and fresh-ground black pepper. Heat 2 tsp. olive oil in a large non-stick pan with high sides; add the onion and saute until it’s nicely browned. Mix together the crumbled Feta, 1/2 cup of the grated Mozzarella, the cottage cheese, and thyme. As soon as it’s done enough to string apart easily, remove the spaghetti squash from the oven, let it cool enough to handle, and then scrape out the spaghetti strings, discarding the skin. Put onions back into the pan with the wilted kale, add the spaghetti strands, and gently combine. Then add the cottage cheese mixture and stir until all ingredients are combined. Spray a rectangular casserole dish with non-stick spray or olive oil. (I used a dish that was 9 x 13 inches, but any dish close to that size will work.) Put the mixture in the casserole dish and spread around so it’s the same thickness everywhere; then top with the other 1/2 cup grated Mozzarella. Bake about 30 minutes, or until the mixture is bubbling and starting to brown on top. Serve hot. This can be frozen and reheated in a microwave or toaster oven. For best results, thaw in the fridge before reheating. If you’re making this for the South Beach Diet, they would recommend using low-fat cheese and low-fat cottage cheese. With full-fat cheese, this would be great for any other type of Low-Carb eating plan. If you want nutritional information for a recipe, I recommend entering the recipe into Calorie Count, which will calculate it for you. Katy, so glad you enjoyed it! And bacon, of course that would be good! I couldn't decide between this recipe and your pesto baked squash recipe, so I combined them and added sausage. It was delicious! Karissa, I like the sound of that! I made this for the first time tonight and it is FABULOUS! My husband ate three helpings and didn't complain about a meatless Monday meal. Thanks so much for all your great recipes. They make South Beach fun. Kathleen do glsd you liked it! 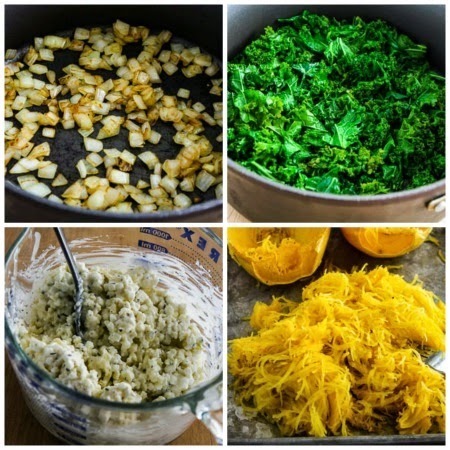 Spaghetti squash is one of my favorite veggies. This sounds great. Thanks for linking to my post. Barbara, my pleasure! Glad you like this idea. This casserole sounds so good and I love all of the healthy ingredients in it! Thanks Kevin, and so great to see you back online! I love finding new recipes that use spaghetti squash since I can never seem to figure out what to do with it! This sounds like something I need…especially since we're about to get a TON of snow! Joanne, I loved the combo of squash and kale in this dish. I hear three feet of snow for you guys. Yikes. Sending warm thoughts! And I just used my last spaghetti squash of the year…. I'll save the recipe for next year. It looks delicious. Thanks Katie. Our stores here have it pretty much year round, but it would be great to have your own home-grown spaghetti squash.